When I arrived, Z was saddled and waiting in the roundpen. RH was off on a trail ride. 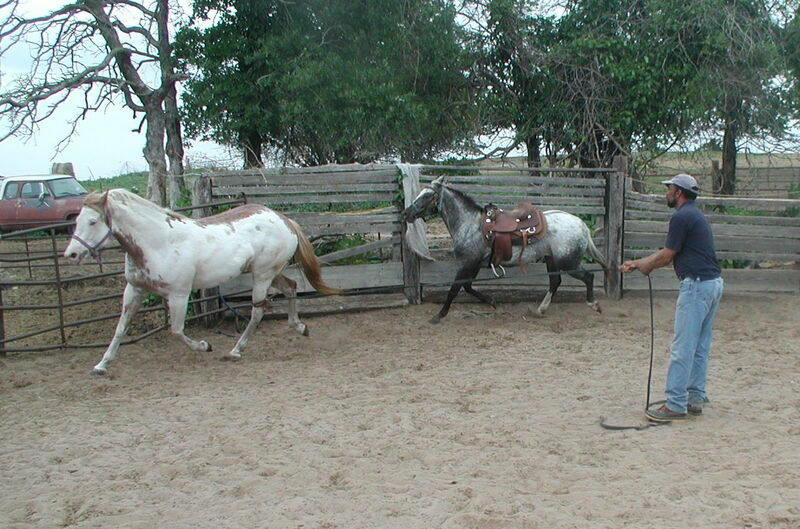 This is a typical western cultural, horse training idea where the horse is expected to wait (I actually call it the Cowboy Wait). I don’t have a problem with it as long as it is not excessive or abusive (deprives horse of water, food, in hot sun etc… and yeah I’ve seen it this bad) as a horse career requires a lot of waiting (think about horse shows!). 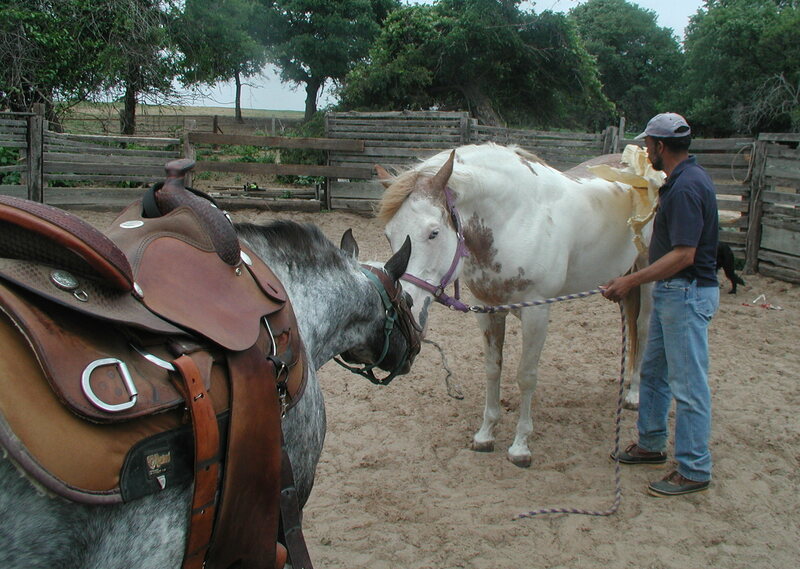 When Robert arrived, he immediately introduced Molly’s horse, *L* into the roundpen. Z wanted to help her understand the schedule by stepping on the tarp for her and following her about. BTW *L* massive size and height, makes Z look like a PONY! Z: Hi! It's nice to meet you! You can see that *L* is far more leery about this pool noodle with pie plates then Z. Part of this is because Z has seen all of this and the other is L just got here. I really liked how Robert used pool noodles to touch the horse safely by being a short distance from any striking range. In the work, Robert has done with Z that I’ve seen, he likes to immediately start working the horse, using homemade tools (like the one above) to evaulate their reactions as well as how quickly they calm down. As Molly and I discussed later, it’s also a bit of the psychological: the horse is uncertain and looks for security. 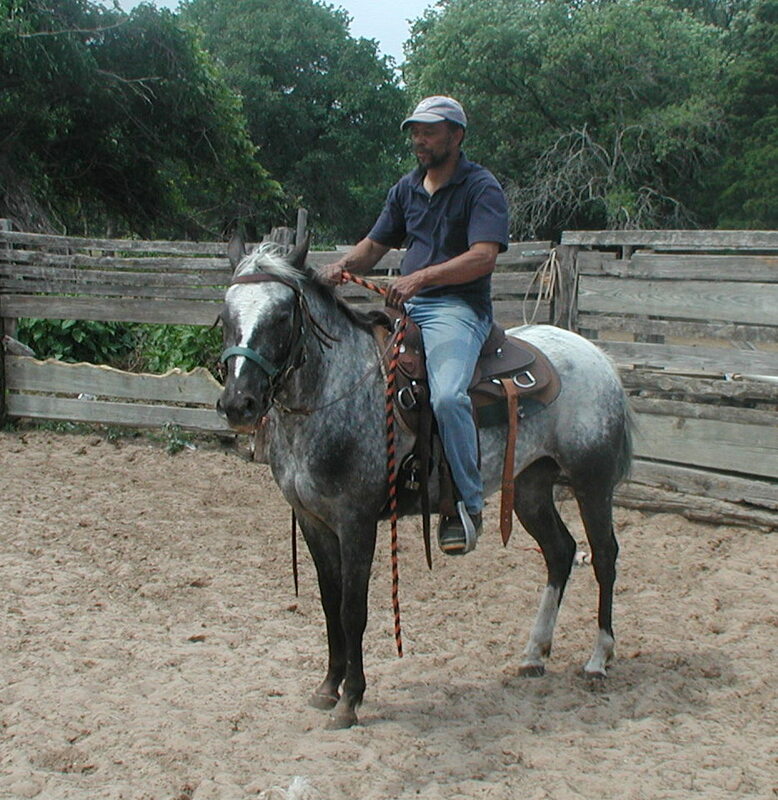 Robert is there as well as another horse to show them they can trust the process. 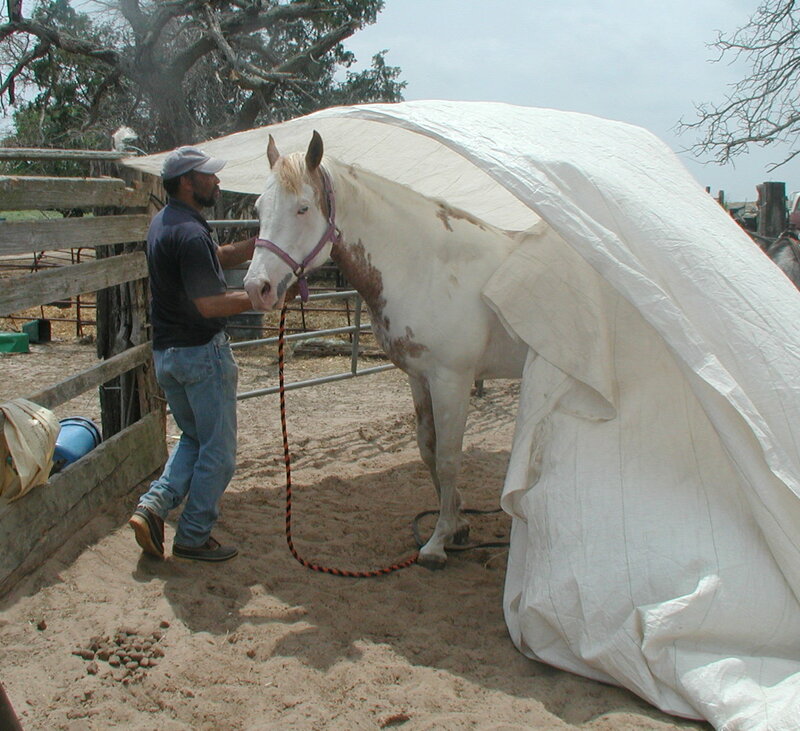 For example, Z did the tarp first, and then he asked L to do it later. This approach works for Robert because he never does anything in a hurry. He is not about must do tool A, then tool B, then tool C all in 15 minutes. 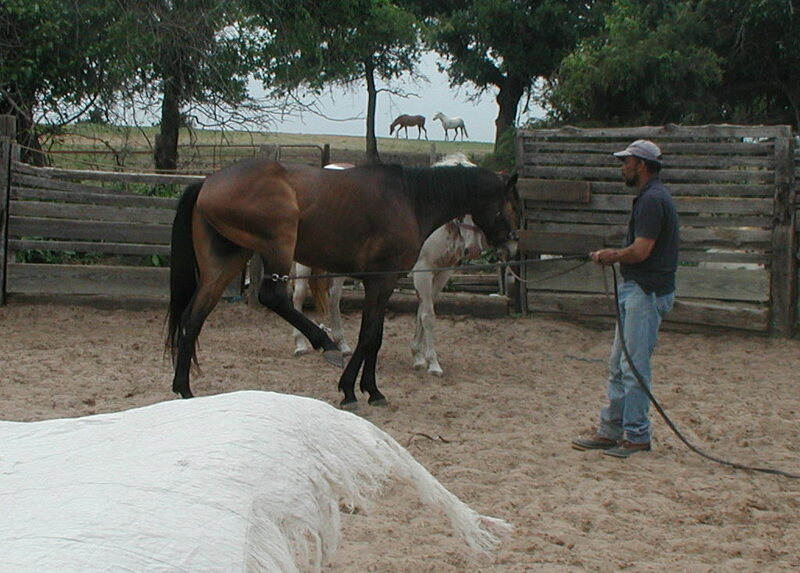 Or lunging the horse for 30 minutes to an hour until it is so exhausted it is willing to do anything (note: none of the horses are sweated or even really nervous). All this work took place over hours and often he would switch horses and let one rest, or take a phone call, and in one instance, eat down a sandwich while standing at the gate talking to us. Both Z and L have ticklish flank and leg issues – both have kicked humans and have been highly reactive to being touched in certain hind body areas. The approach he used with L was similar to what he used with Z on the first day – fastening a rope around the gaskin attached to a lunge and letting the horse react. Since L got wilder during the lunging, he switched her to being tied (as she already knew how to tie) to limit the panic (with a horse who didn’t know about tying, this would panic them more) by limiting the area she could move. 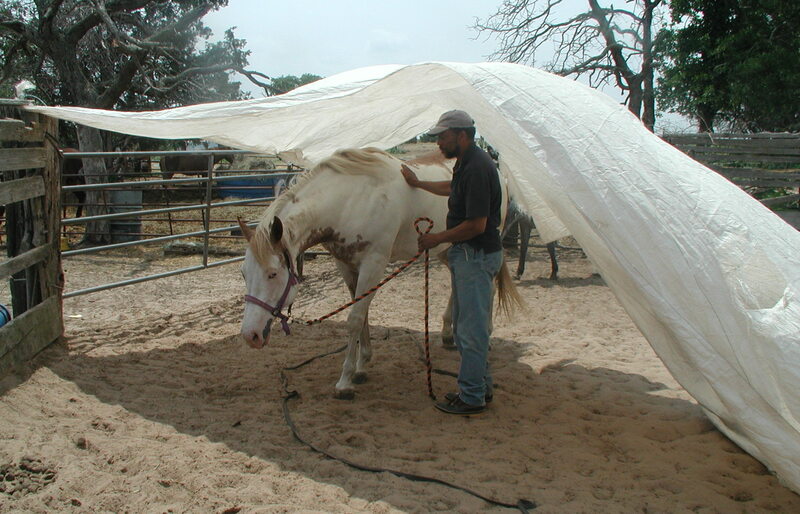 This method allowed a lot of pressure to be used, without endangering the handler. Personally, I thought this was great, though I think from the photos people might see this as rough or harsh handling. The reality is that some horses need to be exposed to rear leg handling and it has to be done in a manner safe to both horse and handler, which leaves few options. 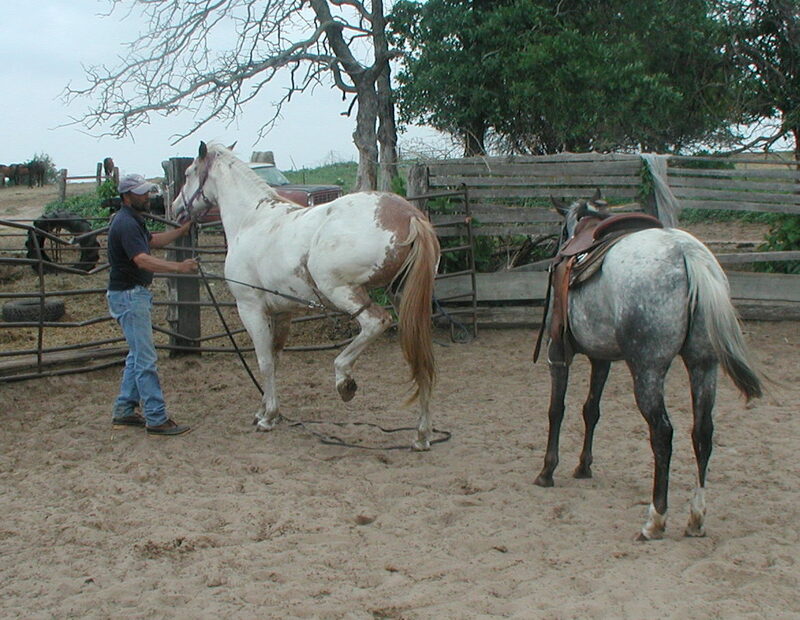 Another method he used was a flank rope. I’m not going to go into it here because as we talked, he mentioned two instances where experienced horse people got themselves hurt. It’s definitely something for people who know what they are doing to use, not amateurs. However, needless to say, I thought it was an ingenious and cunning method for those horses who are ticklish in the flank and back belly area. As this is indeed L’s issue, as evidenced by her stupendous, double hind leg kicks’ as high as my head, it was a great way to safely introduce the idea she can tolerate being touched in this area without anyone getting hurt. I have had some worries about Z being at the trainers, because a previous horse who was sent to a trainer ended badly, however, during our sessions, it was clear that Z did not fear Robert and often sought him out when he was working L. She was also very affectionate to me (which last time I had visited she was not) and got a lot of wither scratchings and “I love you’s” whispered into her ear. This entry was posted in Training, Z. Bookmark the permalink.